My cousin and two sisters spread the gospel of the kingdom of Almighty God to my wife and me. My wife accepted it. 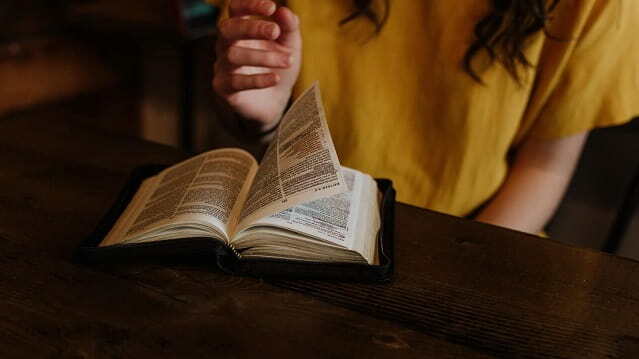 However, as a denominational leader reading the Bible much more than them, I didn’t think anything of them at all, nor did I want to hear their fellowship and testimony. Later, whenever they came to have a meeting with my wife, they would invite me to join them, but I made excuses to refuse. Once, I really couldn’t wriggle out of it, and thereby attended the meeting. However, when they said, “Only by keeping pace with God’s work of the last days, can we obtain everlasting life,” I couldn’t accept it. I thought: The Bible is the way of eternal life bestowed by God. As long as I hold on to the Bible, I then will obtain eternal life. From then on, I listened to their fellowship no more. One day at noon, my wife advised me to catch up with God’s work of the last days early, lest I should be forsaken by the Lord. I said, “If you wanna listen to and believe what they said, I won’t object to it. But I remind you; it is certainly right for us to hold on to the Bible and the Lord’s way. Believing like this, we will certainly gain eternal life. When they come here next time, don’t open the door for them. Locked outside, they will go away naturally.” My wife said, “Is it proper?” I said, “We should have faith in the Lord. We shouldn’t blindly obey them without discernment, otherwise our own life will be harmed. It is most important to receive life by believing in the Lord. We’d better think carefully before we do.” My wife was affected by my words, and accepted my opinion. She agreed not to open the door for them next time. I gave a nod of approval. The next evening, the northwest wind blew strongly. It was very cold. My wife and I had supper early and went into bedroom. Soon afterward, hearing a knocking on the door, I knew it was my cousin and the others who came to spread the gospel of the kingdom to us again. So I said to my wife, “It is our cousin and the others knocking on the door. Don’t open it for them.” As my wife sank into a dilemma, I beckoned her not to open the door. We quietly lent an ear to what was going on outside of the door. After half an hour or so, they went away. Then I took a seat and saw the Bible peacefully. After a while, I felt bad and lay in bed. But my uncomfortable feeling got more and more serious, and moreover, I began to have a headache. Even though I wanted to pray to the Lord, I couldn’t get up. I said to my wife feebly, “I got a bad headache, and feel unwell. But I didn’t have a cold. Why does my head ache?” She said quickly, “Tonight, we didn’t open the door for our cousin and the others. What we have done must be wrong. We’ve offended the Lord.” I touched my head and reflected on myself: Did I really offend the Lord as to my closing the door on them? Could what they spread truly be the return of the Lord Jesus? Does the Lord really do a new work beyond the Bible? On such a cold day, I shut them outside the door—this couldn’t be done by an unbeliever, let alone a believer in the Lord. I simply had no humanity in doing like that. I have read the Bible for years, and often preach the Lord’s words. I, however, failed to live out His words and didn’t have love toward the brothers and sisters. Didn’t I shame the Lord’s name? Thinking about all of this, I came to regret, and felt guilty within my heart. I said to my wife miserably, “Maybe we are wrong. Well, we really shouldn’t have treated them that way.” She said, “After observing them these days, I have never found they had ulterior motives. What they talked about was in accordance with the Bible. They invited you to attend, but you were always reluctant to do that. The Lord Jesus said, ‘Blessed are they which do hunger and thirst after righteousness: for they shall be filled’ (Matthew 5:6). We now cannot feel the presence of the Lord. We are hungry in our spirit, but we don’t actively investigate. The Lord sent them to preach us the gospel of kingdom. This was the love of the Lord falling upon us. We should seek and investigate. Next time, we must listen to them carefully.” I agreed with her. After that, I prayed to the Lord silently in my heart, “O Lord! Tonight, it is so cold. I shut the brothers and sisters believing in Almighty God outside. I was so lacking in humanity. They repeatedly invited me to communicate with them together, but I refused all along. And I always looked down on them and thought myself higher above them, without holding a heart of humble seeking. O Lord, my heart is too hardened. You let me fall ill and endure sufferings. This is out of Your discipline, and also is Your love to me. Thanks for Your grace. I am willing to repent. Next time, when the brothers and sisters come again, I will humble myself and seek Your work. May You lead me to be able to discern Your voice….” The next day, before I knew it,Ｉcompletely had recovered from my illness. Thanks be to the Lord.